I'm very excited to share with you readers that I am an Orange Naturals Ambassador for the next six months! Not sure what Orange Natural is? It's okay, you're not alone. This is why I'm sharing with you today. Orange Naturals is a company that provides healthy natural products that your entire family can enjoy. They're known for their ND Shakes that are vegan with no artificial ingredients as well as no dairy, gluten, soy, eggs, nuts and GMO products. They're safe for the entire family. They have shakes that are specifically made for men, women, kids and teens. They come in two flavors, chocolate and vanilla and they taste delicious! I have to say, my favorite seems to be the chocolate. I'm not only a mom and wife, but I am a provider to both my kids and husband when it comes to what we eat and drink. I am the main grocery shopper in our household and decide what products will be added to our kitchen. With having picky eaters, it's definitely hard raising little ones and getting them to eat their daily servings of fruits and vegetables. I think, like most moms, vegetables seem to be the main problem when getting my little ones to eat them, especially the green ones. What I love most about the ND Shakes is that I can add the kids shake mix in just about anything from ice cream to smoothies, pudding, hot chocolate, cookies and so much more. This makes me happy because my kids think they're getting a treat and not knowing that they're also getting a dose of protein, greens and superfruits as well. My husband and I have been enjoying a shake each morning instead of drinking a cup of coffee, it's been great for me since I can't have coffee being preggos, but my husband, who loves coffee and has to have it, has been loving and enjoying the replacement. 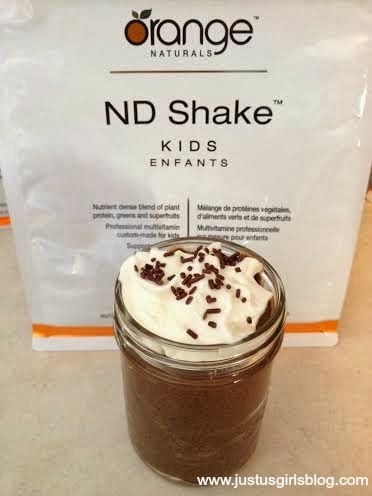 I've also been making daily treats for my little ones that include the ND Shake mix for kids. A few days ago I added a couple of scoops of the chocolate mix to some chocolate pudding mix, added whip cream and chocolate sprinkles and they loved it. 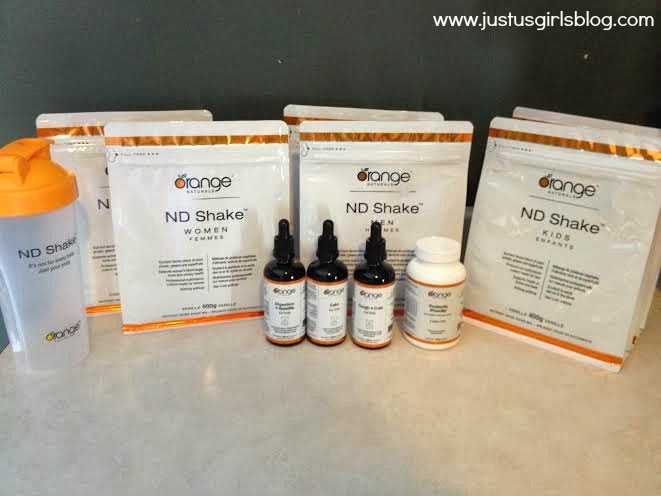 Not only did I receive the ND Shakes for my entire family to enjoy, I also received their Digestion + Appetite to help with relieve from upset digestive, Cough + Cold to help fight the infections, this has been very helpful through this Winter since my kiddos were sick. I also received their Calm for Kids, which helps with restlessness and nervousness along with their Probiotic Powder that is used for toddlers to teens. For more information about Orange Naturals and their products, you can check them out on their website, their new blog, Naturally At Home, that's tailored to help moms bring natural health into their homes. Also be sure to follow them on Facebook and Twitter and be sure to keep checking in over here at Just Us Girls for more information about their products that we'll be sharing these next few months.